The Democratic candidates once again attracted the majority of campaign coverage last week—and they were an eventful seven days. The two contenders split the May 20 primaries, with Hillary Clinton dominating in blue-collar Kentucky and Barack Obama winning in green-tilting Oregon. Clinton’s determination to continue her campaign also generated more media speculation about a ticket uniting the two rivals. And the week ended with a firestorm caused by the former First Lady’s evoking the 1968 assassination of Robert F. Kennedy in describing her reasons for staying in the race. For all that, the dominant media narrative on the state of the race remained the same—that Obama was on the cusp of securing a hard-fought nomination. That storyline has been unchanged since the North Carolina and Indiana primaries on May 6, when the pundits declared the race over for all practical purposes. What did change noticeably in the media’s campaign narrative last week was the role of presumptive GOP nominee John McCain. After largely being treated as a bystander to the Democrats’ battle for weeks, he emerged to become a central newsmaker and featured player in the coverage. 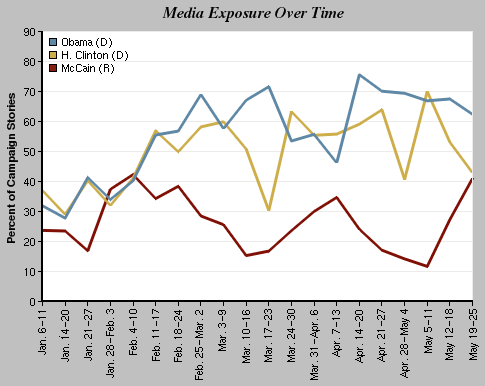 Appearing as a significant or dominant newsmaker in 41% of last week’s campaign stories, McCain still trailed Obama widely (62%) and Clinton narrowly (43%) in the competition for media exposure, according to PEJ’s Campaign Coverage Index for May 19-25. But that 41% represents the Arizona Senator’s highest level of coverage since way back on Super Tuesday week (Feb. 4-10). As recently as the week of May 5-11, McCain was registering as a virtual afterthought, at a mere 12%. Two weeks ago, the Republican got back in the news (at 27%) when President Bush’s remarks about appeasement triggered a pointed foreign policy exchange between Obama and McCain. Last week, that argument over whether to talk with enemies of the U.S. continued to rage. But McCain was also the catalyst for a number of other major campaign stories. They ranged from his departing advisors with lobbying connections to the vice presidential hopefuls arriving at his Arizona home, from his repudiation of a controversial pastor to his release of medical records. When you add up the story lines that directly involved McCain—the foreign policy fight, the Rev. John Hagee flap, his health records, the GOP veepstakes, and the lobbying controversy—they add up to one-third of last week’s campaign stories. McCain’s central role in the campaign narrative last week seems to reflect both his and the press’s sense that even if the Democratic race is not officially over, the general election campaign has begun. It also suggests that exposure is not always a reflection of wanted or positive attention. Overall last week, coverage of the race for the White House filled 37% of the newshole, as measured by PEJ’s News Coverage Index for May 19-25—a fairly typical level of campaign coverage in recent weeks. It easily dominated the news agenda, with word of Senator Ted Kennedy’s brain tumor diagnosis finishing a distant second at 8%. The campaign was the No. 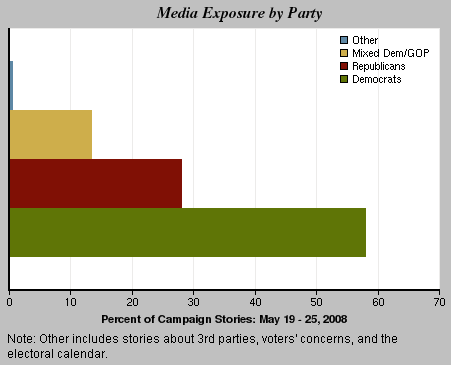 1 story in all five media sectors, but as is typically the case, it was most prevalent by far in the cable TV coverage (65% of the newshole) and in the radio sector (49%), which includes the radio talk hosts. The week started off with McCain having to deal with the flap that arose after a number of lobbyists departed his campaign, as a candidate with the reformer reputation moved to defuse concerns he was tied too closely to insular Washington interests. By dealing with that issue now, the McCain campaign may have dealt with a potential problem before the media scrutiny became more intense. In another significant way, however, the Hagee and Wright controversies differed. 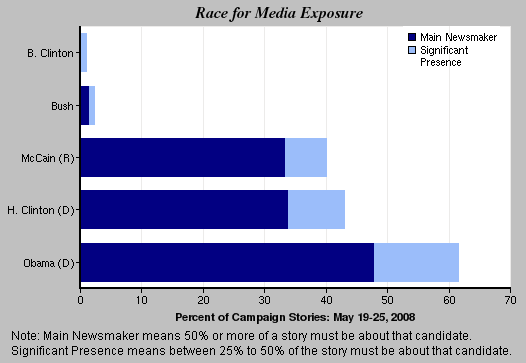 At its height, during the period from April 28-May 4, the Wright story accounted for a full 42% of that week’s campaign stories. Last week, at what to date is its apex, the Hagee episode accounted for only 8% of the election coverage. In a week that saw McCain face his share of good and bad headlines, that story was just what the doctor ordered. The sudden and sobering announcement that Senator Ted Kennedy’s seizures turned out to be caused by a malignant brain tumor was the second-biggest story last week, accounting for 8% of the newshole as measured by PEJ’s News Coverage Index. (That story got the most attention on network TV news, where it filled 15% of the newshole.) Next came the continued coverage of rising gas and oil prices (6%). The Chinese earthquake, with its updated toll of nearly 90,000 dead and missing, was next at 5%. And a Texas appeals court ruling that the state was wrong to separate hundreds of children seized at the polygamist compound from their parents helped make that case the fifth-biggest story (4%) last week.